I liked that outfit so much, I went ahead and wore it two days in a row. Judge away. As much as I love shopping for myself, I LOVE shopping for my kiddos and all of the other kiddos we are lucky enough to have in our lives. Anyone interested in a kids' fashion post? 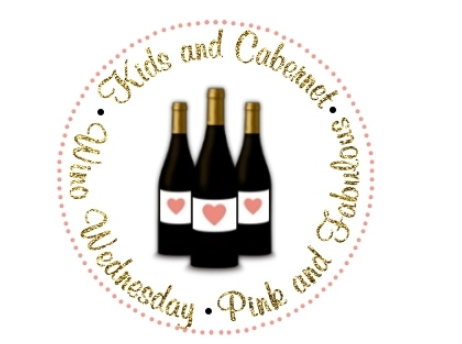 Today I am guest posting over at East Coast Chic about what's in my bag AND over at Kids and Cabernet for Wino Wednesday! Make sure you stop by and check them out! Love that fur vest! I definitely don't blame you for rocking it two days in a row, I would! :) Love your Hunters too! I love that outfit with the fur vest! 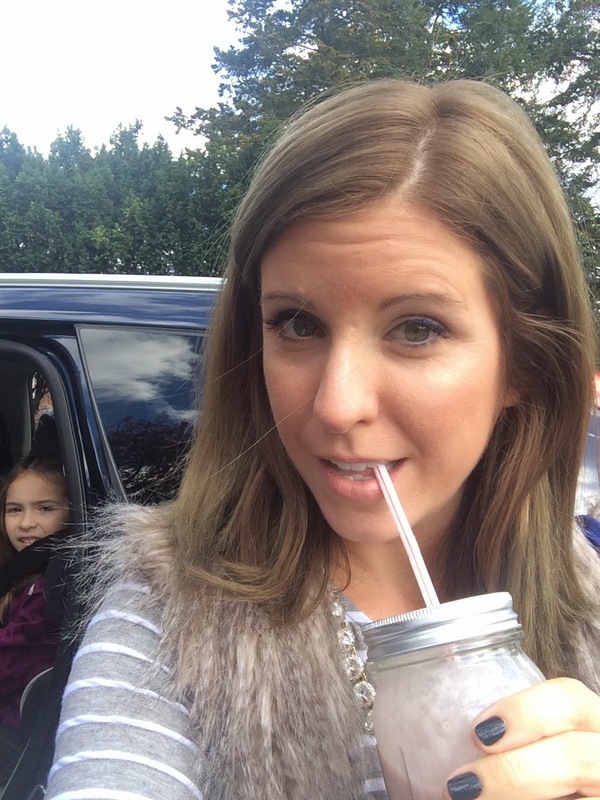 I also love how your daughter's face in the background haha. Happy Wednesday! Ok, I think I need to get a J Crew swing sweater! They look so comfy! Love your fur vest too!! Love the fur and boot combo! 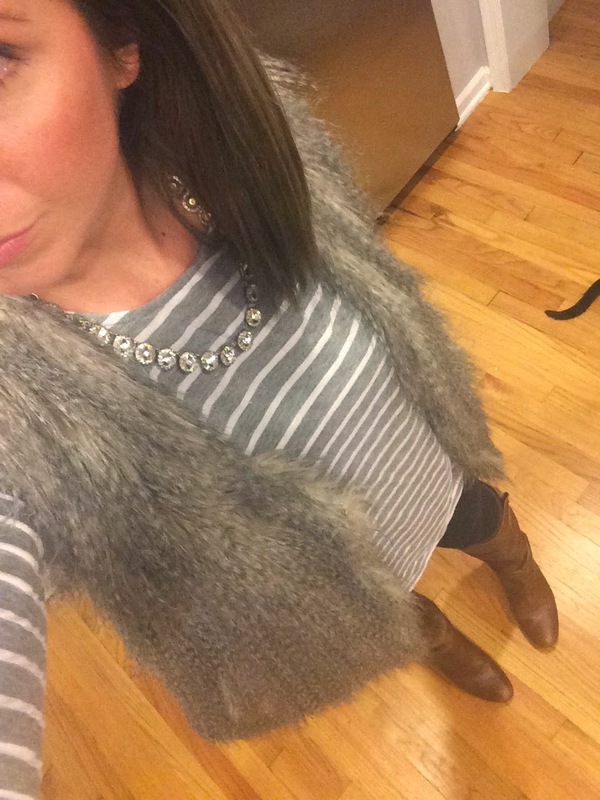 I'm seriously in love with your fur vest and how cute is that Horseshoe scarf - did you end up keeping it?! You've taken over my Blogger reading list today - and I kinda love it! Good outfits need to be worn multiple times so no judgment here ha. Those boots and that fur vest must happen in my closet IMMEDIATELY!!! Love the outfits! I also hate when my schedule gets jacked up. These school holidays are cramping my style. I like the best and those boots are something that I definitely in wet weather. I love the way you have made outfits look completely different with accessories. I am sorta lazy these days and do not a lot of accessorizing. 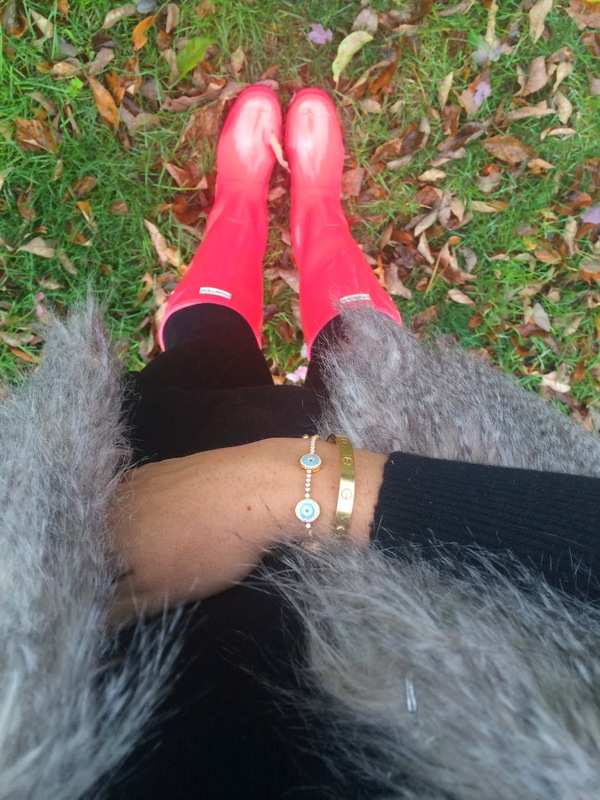 I was able to break out my Hunter boots this week, too! Love your red ones, I kind of want those too but my husband says two pairs may be excessive... nah! LOVE that faux fur vest you have!!! Thank goodness that vest isn't available in my size otherwise it would be in my shopping cart right now!